Many parents and grandparents dream of helping loved ones attend college and post-graduate programs. One way to help them qualify for a student loan or obtain a loan at a lower interest rate is by being a co-signer. When co-signing a loan, you are promising to pay the loan back if the student-borrower fails to do so. FDIC Consumer News wants to remind readers that co-signing a loan is not a decision to be taken lightly. According to the Consumer Financial Protection Bureau (CFPB), an increasing number of consumers are carrying student loan debt into their retirement years. From 2005 to 2015, the number of Americans age 60 or older with one or more student loans quadrupled from about 700,000 to 2.8 million, and the average debt load for these individuals roughly doubled from $12,100 to $23,500. This includes parents who have co-signed a student loan or have taken out a student loan on behalf of their child — in the latter, only the parent is responsible for repaying the debt. If you are a co-signer on a student loan, you are just as responsible for the loan payment as the primary borrower, who in this case is the student. Make sure you have maxed out federal loans and federal financial aid. Families should consider scholarships and financial aid from the federal government, states, schools, companies and organizations, as well as federal student loans offered by the U.S. Department of Education. Federal loans offer important benefits for student-borrowers, like fixed interest rates and income-based payments. Most students take advantage of federal student loans as well as other financial aid, such as grants and work-study programs. Families also can use “PLUS” loans — federal student loans that can be taken out by parents and, in some cases, stepparents (but not grandparents or legal guardians), and do not require co-signers, except in limited circumstances. Students who are left with a gap in financing their education costs after maximizing federal loans and financial aid may turn to private student loans issued by a bank or another financial institution. However, unlike federal student loans, private loans often require a co-signer because most students have a limited credit history (a record of borrowing money and paying it back). For your family member: How do you plan to repay this loan? Student loans appear on both the student-borrower and the co-signer’s credit report along with other credit obligations, like credit cards or car loans. 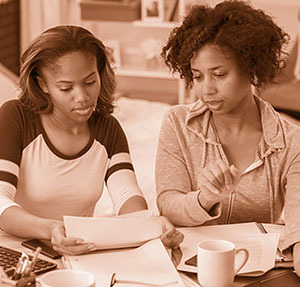 Remind the student-borrower that failure to make timely loan payments can reduce your credit scores as well as his or hers, and that can make it harder to obtain credit with optimal terms, such as a lower interest rate. For yourself: Can I repay this loan, if necessary? “As with any major financial obligation, you should always prepare a budget, consider repayment plans that will fit that budget and have backup plans if the student-borrower defaults on the loan,” said Ortiz. Parents or grandparents thinking about co-signing a student loan also often ask if their Social Security payments or other income could be withheld (garnished) if the student-borrower defaults on the loan. The answer depends on the type of loan. Private loans: Banks and other private companies that offer private student loans are not allowed to garnish federal payments if the student-borrower or co-signer can’t or won’t repay the loan. The lender, however, can pursue other ways to collect the amount due. Federal loans: A borrower who defaults on a federal student loan may be subject to the garnishment of money from income tax refunds, Social Security income and other federal payments. Consider alternatives to co-signing a loan. It’s often preferable to act as a guarantor on a student loan instead of a co-signer. As a guarantor, you only become responsible for a loan in default after the lender has exhausted all means of getting repayment from the primary borrower. In most instances, the loan does not appear on your credit report until the lender seeks repayment from you. For more information about student loans, start at the websites of the CFPB and the U.S. Department of Education.